2005 was an interesting year for Malice. I graduated, I started out on my own, I met the love of my life, and I went to my first Halloween Horror Nights. I had always wanted to go, but never ended up able to. That year I was my own man, and by God I was going! 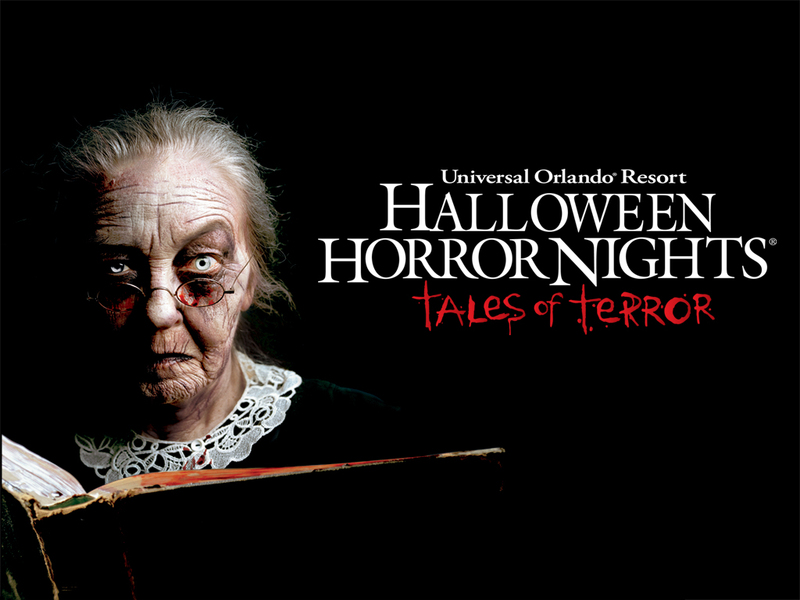 HHN 15 was presided over by the ever watchful Storyteller, Elsa Strict. You really never found out much about Elsa that year. You didn’t even find out her real name until the next year. All you really knew is this creepy old lady was going to aid in dragging you into the world of Terra Cruentus. This world was populated by all different flavors of demons, monsters, and madmen. All of which were under the dominion of the ever sadistic Terra Queen. Now if your kind of confused here, this is why. That year the Terra Queen was supposed to be the Icon. She was even featured on some of the shirts. However, there was trouble with the Queens costume, and the idea was scrapped for The Storyteller. Ultimately the confusion could have been cleared up by simply setting the old biddy at the gate reading a book. Giving you the feeling of as she is telling you the story, you are stepping into the world of Terra Cruentus. Also this year was the second year that the event was spread across both parks. It was the first year though that all the areas were tied in. As random as they may seem, the ideas, they were actually all in different service to the Queen to make the blade for the Ultimate Sacrifice. If you were an avid internet hound, you could have played along on the website and with the event and got to go to an exclusive bash on Halloween night were you find the ultimate sacrifice was the Queen herself! The whole storyline was just nicely thought out, and very interesting how they tied it all in. Now that you are familiar with the event, let us talk about the Scarezones. Each Scarezone was themed to the houses around it. Overall they achieved greatness with this effect, with the exception of one. Here’s my impression of them. 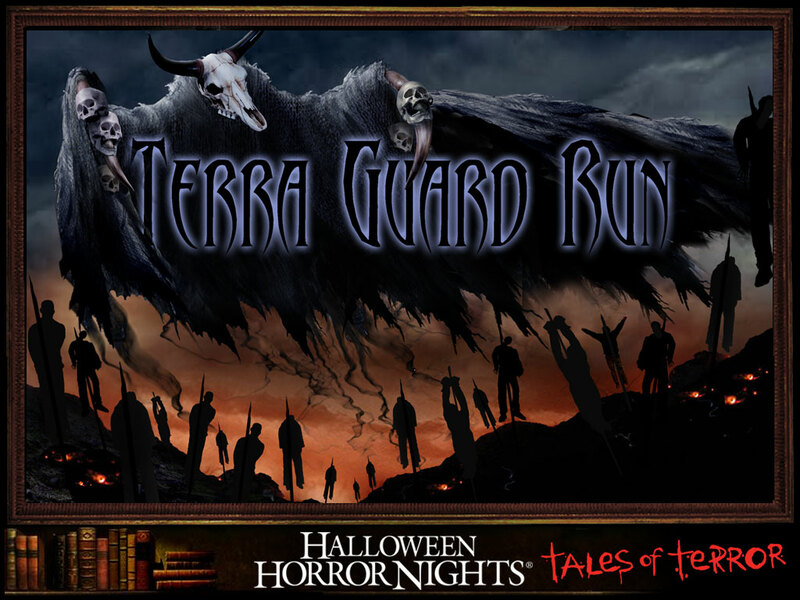 Terra Guard Run (IOA Port of Entry)- This area was a good mood setter. You entered through the gates and were met by very tall demon-esque creatures on stilts. The Fog was very think, almost giving you the feeling of being transported into the book. As I said before, this area would have been ten times better if the would have added the Storyteller at the beginning of it. This area lead you to the Terra Throne where all the blood sacrifices were made. Like I said, this really set the mood for me. 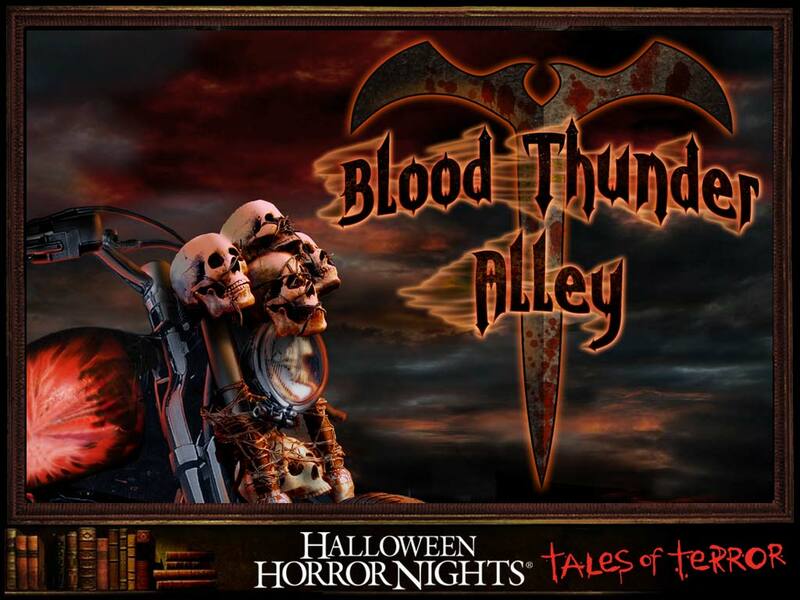 Blood Thunder Alley (Marvel Island)- My favorite area of the event. An area that looked to be Mad Max and From Dusk Till Dawn’s love child. Vampire Bikers everywhere. Dancing girls in cages. And Chainsaws….oooh the CHAINSAWS!!! Ultimately the best one as far as design. North Hollow (Toon Lagoon)- This was the coolest area looks wise. An area filled with strange beings that would jump out of the fog at you. The cool part came from the laser light effect cutting through the fog over your head making it look like you were covered in a sheet of green fog. The only thing I would really complain about is the lack of scares in this area. 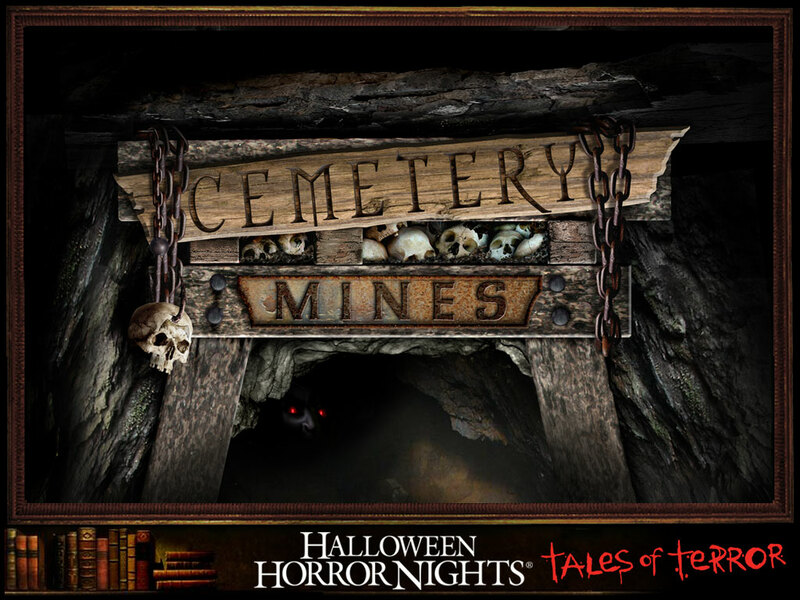 Cemetery Mines (Jurassic Park)- I feel this one won my vote for the most scares. With the thick jungle atmosphere, it was easy to hide bush men. And the mole people! Don’t get me started. I made a pet of one and named him Spike. All in, I think the scareactors in this area did a good job of reacting to the people (I made my pet attack a flock of blondes…yes I’m that good!). There was a second part to this zone too, although I don’t feel they made it prominent enough. 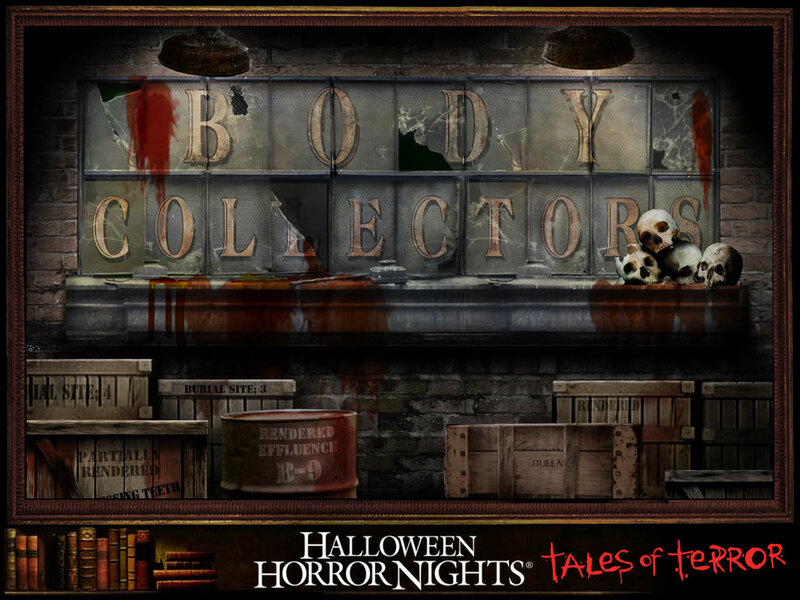 The Body Collectors could be seen marching through the area, after “harvesting” some fresh organs. It kind of made me take a step back at first because they looked like the Silent Gentlemen from Buffy the Vampire Slayer. 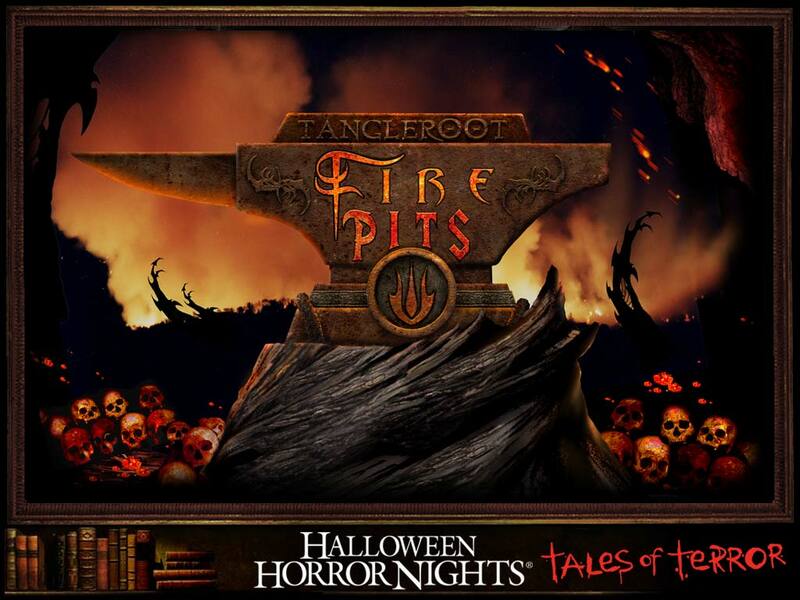 Fire Pits (The Lost Continent)- This area was supposed to be the Medieval aspect of the event. Using the theming of the area, they were able to really nail it on the head. However I was left wondering why this part was so devolved. They were in the middle-ages, and still mastered the craftsmanship to make chainsaws. That part was a bit inconsistent. The trolls were a nice touch, but the stench from the chainsaws and the fumes from the gas torches coupled with entirely too much smoke, I was really never able to enjoy this zone. South Hollow (Suess Landing)- This area was the problem child. They came up with the excuse about halfway through the event that this area was only to be open on peak nights. I know because I went once earlier in the month and two other times. I only saw them attempt this area once and it sucked. The area was populated with the same characters as the North Hallow. There really was no other theming then that. In fact when I went through, there were no lights, no nothing. I got concerned because I thought the park was closing. They dropped the ball here, that’s for sure. 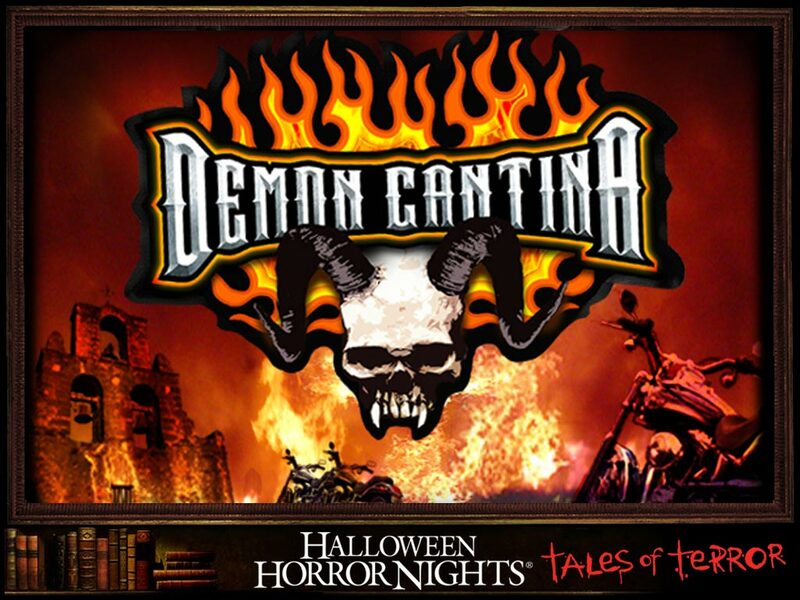 Demon Cantina (Carnage Warehouse)- I loved this house above all others that year. I’m such a fan of From Dusk Till Dawn, there was no way I COULDN’T love this you. Your setting is in an old out west bar (much like the one in the movie). Before you walk in they had a barfing man animatronic outside, giving you either the gross out factor or simply just to distract you. The whole bar is over run with vampires, from the bartender to the patrons. A few scenes to note is the exploding toilet in the bathroom scene (which to add to the gross out factor has what seemed to be a dead body sitting on it). The strobe section is really what caught me and my group off guard. The effect the strobes gave make the vampires look like they were moving around the room at blinding speed. Then the whole house ends with the Devil himself (or what seems to be). I just couldn’t get enough of this house. 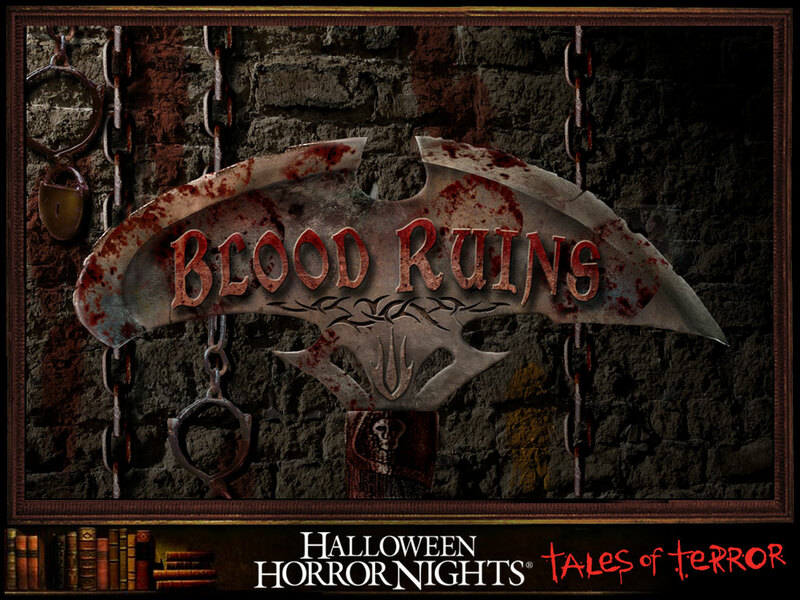 Blood Ruins (Soundstage 22)- Of course the soundstage houses are generally the best. They have the most room, and creative can get an extra head start on them if need be. Blood Ruins really sold the atmosphere that the Fire Pit was going for a hundred fold! Then you walk in, you are met with the facade of an old village ravaged by the plague and death. Bodies strung in front of the gates and this odd burning smell. (That smell get’s stronger later and you find it’s burning flesh…is it bad it made me hungry?) As your walking through, the villagers reach out for help in some cases. Most though are hell-bent on killing you, or hitting you with a side of beef in one instance. There were plenty of little easter eggs through the house. One of which was the Egyptian Book of Life (the gold one from The Mummy). I’m not sure why it was the Book of Life. Maybe it was for irony? At any rate, it was a solid house with solid scares. The only problem was the amount of stuff in some areas. There was one section of the house where I remember people nearly falling over, because some idiot in front knocked a bunch of props over. Props that you almost couldn’t see because of how dark it was. 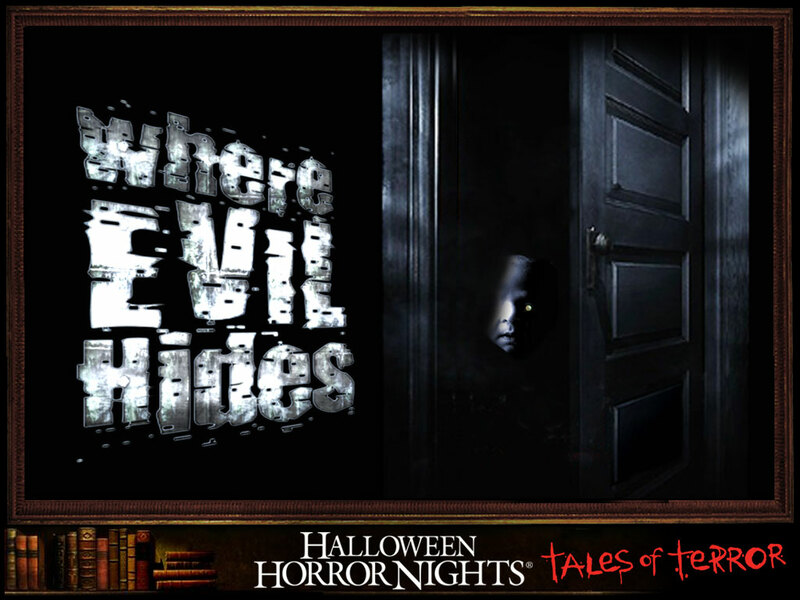 Where Evil Hides (Soundstages 18 and 19)- Where do I start? This was a fun house. As close as you could come to an icon house that year. Where Evil Hides was an assault on your childhood fears. Whispers, open doors (a whole hallways of them! ), the boogeyman, etc… The facade was that of an old house. Much you would expect to see in any neighborhood. 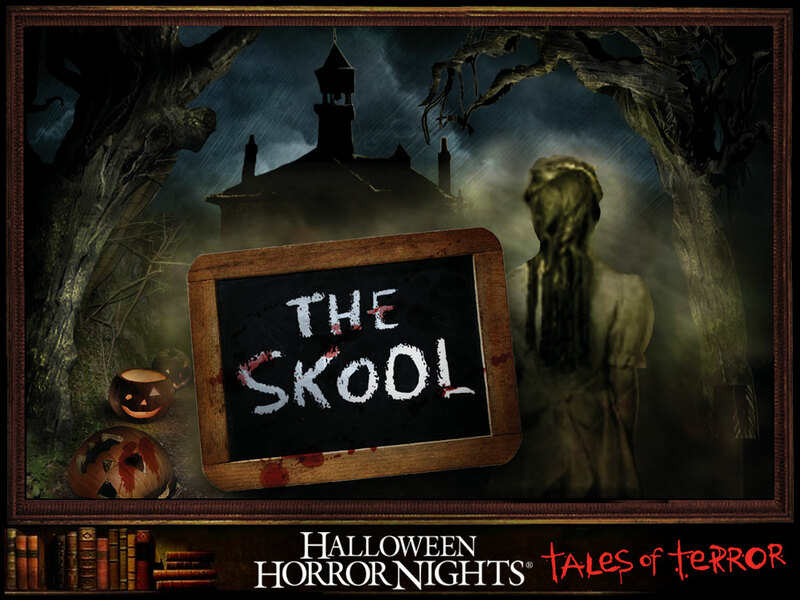 A HHN 15 version of Michael Myers could be seen stalking the front yard (After all he is the boogeyman, right?) The most notable scene was a childs room. You walk into the room to see a little girl sitting on the bed and pointing at the wall. Well, when you fell for it and looked, you were met with a werewolf that would roll out from under the bed and pounce for the scare. (Another time it was a Leatherface-esque maniac bursting out of the closet.) It’s also notable that this house was two stories (You can’t face all your childhood fears without a trip to the Attic). The Trip upstairs brings you face to face with the Storyteller in a scene from the commercial (see below). 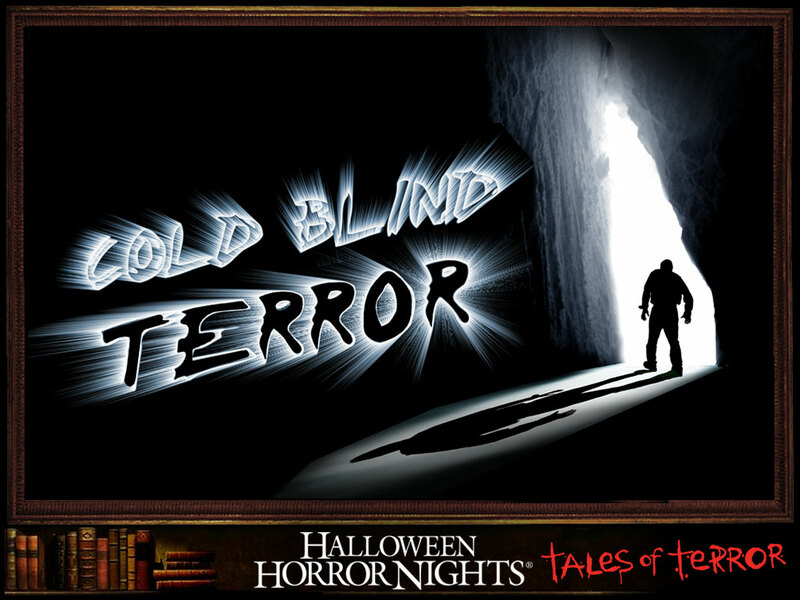 Cold Blind Terror (Soundstage 20)- If you have ever dropped acid and been on a bad trip, you’ve experienced this house. Modeled after the Disorientorium from the year before, this maze brought you through a total onslaught to your senses. Unfortunately, at that point in the night, me and my goofy troop put my darling Seras to the front of the line. (We gave the house too much credit!) There were a few scenes that impressed me. One was a black and white patterned room with strobes and people dressed just like the walls. Made the walls look like they were moving. My favorite room had one of the coolest effects in the world. You walk into a solid white room with 2 statues in the middle. On the wall there is a cluster of those really bright 3 million watt flood lights. When those go off, you can’t see because of your eyes being so used to the light. When they come back on the statues are gone and two men dressed like the statues are in the room. This is the part I couldn’t explain. Somehow, one managed to get in between Seras and me, and one in front of Seras. They got right in my face without touching me or Seras, and we were less than 3 inches apart when the lights went out. Other than that room you went through a series of lame scenes (backlight room with scareactors on skates, room filled with bubbles…and nothing else, and a room where I swear the scareactors forgot about, because nobody was there!) I will say it made me laugh though. 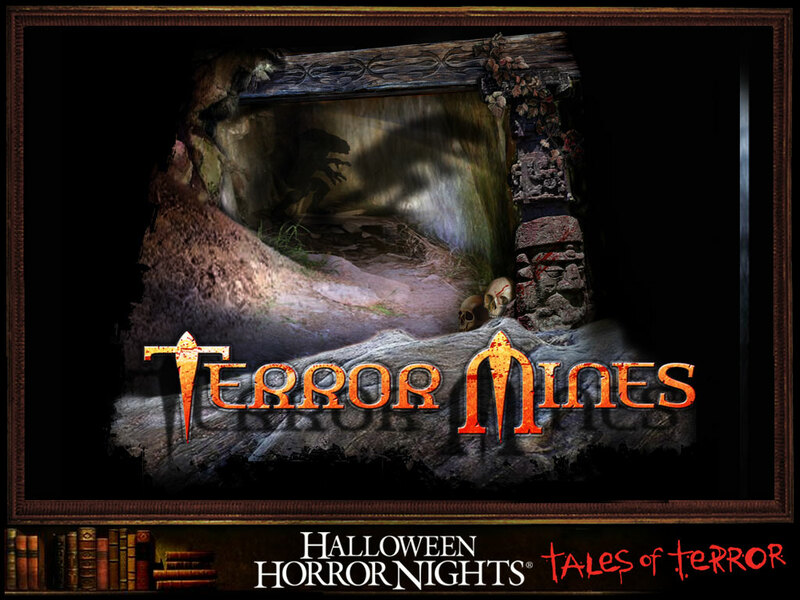 Terror Mines (Poseidon’s Fury)-The rumors of this house is what kept me cautious . The hype however was better than what I’ve heard from others. The hype was you were going through the mines with the only source of light being a miner’s helmet (A light source that would go out in intervals). This didn’t translate well. Only every fifth person got a hat, and it didn’t work all the time. The mole people as cool as they were, never really popped in this house. From what I’ve heard the concept was there, they just didn’t pull it off. Maybe because they had to theme around the ride Poseidon’s Fury? At any rate, this was voted everyone’s least favorite. I would also like to mention the shows. This was back when there wasn’t a whole lot of emphasis on them. There were only two, and one was more of an arrival show than anything. Bill and Ted’s Excellent Halloween Adventure- There is no HHN without this show. It has become as integral as the houses themselves. This year was one of the best. In some aspects I consider it the best. If you have never been, this show is an assault on anything and everything po culture (NOTHING IS SACRED!!) 2005 gave them plenty of ammo (Star Wars, Batman, Willy Wonka, Dukes of Hazzard, The Ring, Family Guy, etc… and even the Fast Food Icons!!) It was definitely a you had to be there moment. Trust me if you find it on YouTube….it’s worth a watch! The Terra Throne- Every HHN has an Arrival show. For this year you were welcomed to the world of Terra Cruentus by the Terra Throne. This was where they made nightly (OK Hourly) blood sacrifice to the Terra Queen. The ceremonies were presided over by the Queens lacky Eel Mouth. He would wander through the crowd spouting off his speeches of praise for the Queen. Planted actors were then taken to the altar for sacrifice by different mutilation ranging from knife to chainsaw! The only thing I have really left out was the Rat Run. It was a large chain link fence area that really had no point. There were air blowers throughout it so people passing by could offer their own little scare. Or sometimes they were on the reverse, and you could get them! The whole thing was built around a tower where Jack the Clown would taunt and harass you. There wasn’t a whole lot of point to it, but it was fun for a laugh. My overall opinion of the event was one of awe. It has been the last event to be over in Islands of Adventure. I’m kind of glad they stopped the two park thing. It made it very difficult to get from one end to the other. I also feel that you are limited in your scarezones in IOA because of the different island themes. Universal is a little more neutral in that respect. I have fond memories of that year, and as they say you never forget your first. Make sure you check out the commercial below for the event. This is the end of this tale….but only the prelude to the next chapter…. This entry was posted on September 20, 2010 by malicepsychotik. It was filed under Halloween Horror Nights .